It seems that only yesterday I was submitting the review for Van Canto Tribe of Force. The times, they must be flying as the Germans are back with the new entry Break the Silence this year. As much as power metal genre seems to be confounded with the certain boundaries, I am frankly a bit surprised that this unusual a capello singing act does not generate more excitement. The first time I reviewed Van Canto, they were a novelty to me, but before Break the Silence hit my desk I have to make the admission, that, in general, I am sold on this collective’s approach to making music, so count me among the fans. To make the tunes sound engaging, rhythmic sing-alongs and do it all with only the use of drums and a number of vocalists creating a polyphony of sounds – this is interesting in and of itself, but make it sound heavy and metal is where power metal fans have to be flocking to Van Canto as a horde of hungry carnivores to a carcass during famine. To be crystal honest, I am still listening to Van Canto trying to look for a “gotcha” moment. Even though I am down with the method, I still want to catch the band using more than percussion and their voices, unable to believe that the tunes like The Seller of Souls don’t use a snappy bass in their riffs, or guitar solos in Black Winds of Hate are just that, the real guitars. After all, and I am convinced of this, piano moments in the Manowar cover of Master of the Wind are real piano. 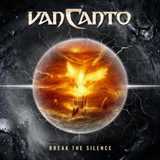 Overall, as it has become customary for Van Canto, the band presents a number of its own tunes and three covers on Break the Silence. Among its own creations, the band has pretty solid epic sounding cuts, like If I Die in Battle and Black Winds of Hate. The former has Falconer-like melodic inflections and, as is often the case throughout the album, an expanded role for the female vocalist Inga Scharf. She may sound a bit boyish in place on Black Winds of Hate, but at times does find a real strength in her voice to complement the epicness accordingly. There are some less grand, more straightforward rockers (Dangers in My Head), classic Germanic upbeat crowd-raising hits (Neuer Wind), but also a bit silly Jaldaboath-styled chorus of The Seller of Souls and not entirely convincing ballad Spelled in Waters. Despite Marcus Siepen (Blind Guardian) contributing an acoustic guitar, the song itself just does not provide that one irretrievable hook. By now traditional covers demonstrate enhanced deviousness and solid bottom end on Alice Cooper’s Bed of Nails, push Sabaton’s Primo Victoria into the instant classic sphere, but the song does fit with the epic slant of Break the Silence. I am still on the fence about Master of the Wind, as substituting female vocals for Eric Adams is not quite enough to elevate that song, however when she sings “clouds above” they are really high up there. The joining of voices in an interesting polyphony when Master of the Wind gathers its strength towards the end is a more profound experience, giving a glimpse of what Manowar could sound if it was made up of a bunch of warrior (and Amazon, let’s not take away from Inga) singers. Very much professional and attractive experience, Van Canto continue moving up on my internal power metal chart (and that is one narrow list). I guess it is tough to expect every song to be a 100 out of a 100 hit, but you can take Break the Silence in one sitting and enjoy it as a whole.